It’s where you’ll find one of the Seven Natural Wonders of the World, Victoria Falls, along with world-class whitewater on the Zambezi River, but does Livingstone, Zambia live up to all the hype that brings thousands of travelers here each year? On a recent trip to Namibia for the Adventure Travel World Summit, a couple of colleagues and I had the opportunity (which was too good to pass up) to make a quick visit to Livingstone to see for ourselves if it lives up to its reputation as an adventure Mecca. The answer is decidedly, yes. 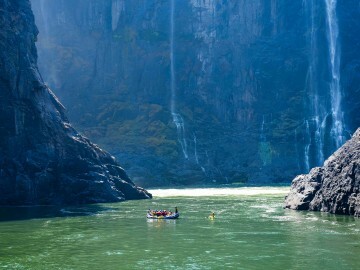 Together, Victoria Falls and rafting the Zambezi River offer one of the most exhilarating adventure experiences on the planet—no question about it. Here’s the thing, as the marketing director for a worldwide rafting company, I probably shouldn’t admit this, but as the prospect of running the Zambezi became a reality, a near-crippling fear crept over me…I had no desire to subject myself to the Class V rapids of the Zambezi. I can empathize if you don’t want to put your life in jeopardy to run a Class V river in Africa that’s teeming with crocs and hippos. I think of myself as more of a solid Class III boater. Upon arrival at the newly renovated Harry Mwanga Nkumbula International Airport, we hopped a shuttle through downtown Livingstone to a site known as Baobab Ridge where United Air Charter offers a variety of scenic helicopter tours of Victoria Falls. From a height of about 1500 feet, we got a bird’s-eye-view of the falls and the magnificent zig-zagging chasms of the Batoka Gorge. 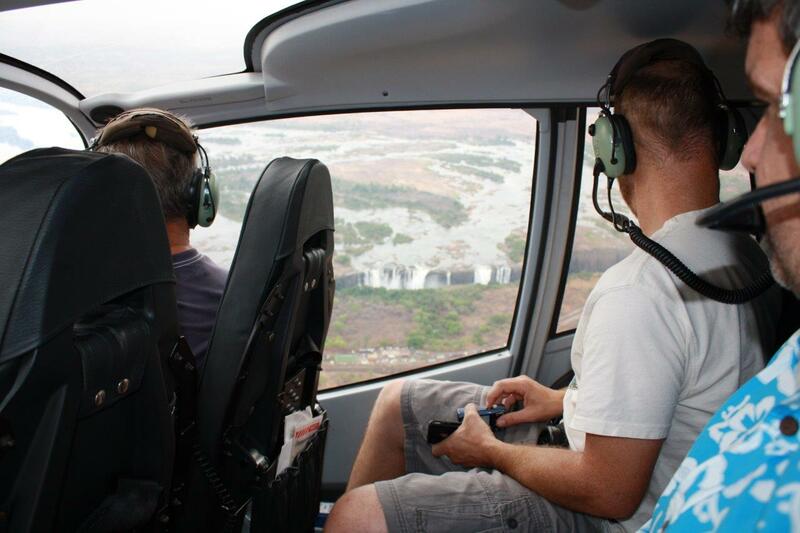 The pilot also passed over Mosi Oa Tunya Game Park where we spotted herds of giraffe, buffalo and elephant. Many companies offer a sunset river cruise on the Zambezi (above the falls), but we chose the Lady Livingstone based out of the David Livingstone Safari Lodge. This is the perfect way to wind down at the end of the day with heavy hor d’oeuvres, an open bar and live music, all offered as part of the cruise. Not to mention, from the boat we spotted dozens of hippo, elephant, baboon, buffalo and countless birds as we watched the sunset over the river. During the hike down to the river I tried hard not to think about getting sucked into the vortex or being bitten in half by a hippo. 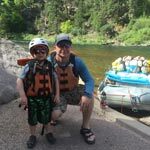 I boarded the raft with my mind still focused on finding a way out of the canyon, but before I knew it, we were paddling downriver on a collision course with “Stairway to Heaven,” or Rapid #5—our first Class V rapid. Like dropping off a two-story building, we threaded the needle through the scary-big pour over on river right and the enormous crashing wave on the left. We made it…it would appear the Nyami Nyami (Zambezi River God) had granted us safe passage this day. Gulliver’s Travels, or Rapid #7, is the longest of all the rapids on the Zambezi and arguably the most exciting. 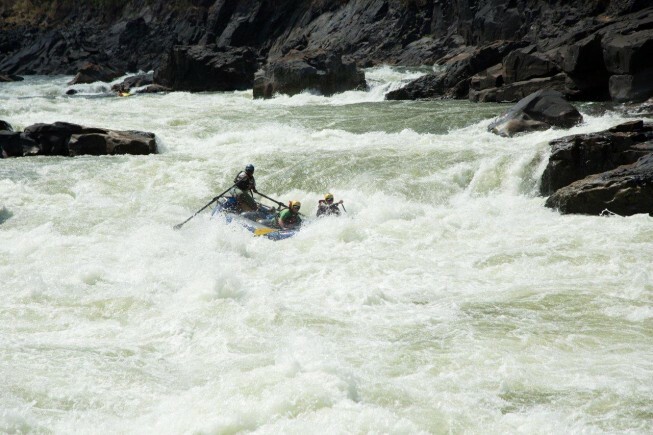 By this point I’d all but forgotten my fear of the Zambezi and I started to relish the precision paddling, warm crashing whitewater and bigger-than-life thrills on one of the greatest whitewater rivers on Earth. By Rapid #10, I was wishing we could keep going, but just as quickly as I’d warmed up to the Zambezi, we were hiking back out of the gorge to the van. The hike was a near vertical scramble of a few-hundred feet to the rim of the canyon. Overlooking the river I realized my colleague was right, “it’s just fluffy Class IV mate.” With any luck, I’ll be back to run the next 25 rapids and pay my respects to Nyami Nyami again before a proposed dam on the Zambezi drowns another of the world’s great rivers. 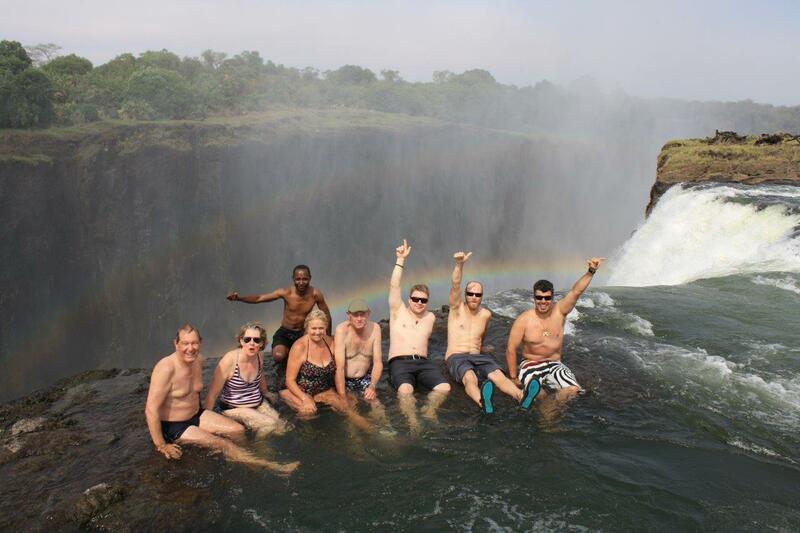 Before our flight back to Johannesburg for the long journey home, we booked a tour to Livingstone Island to swim in the Devil’s Pool at the edge of Victoria Falls. Of all the crazy things I’ve done in my life, nothing quite compares to the thrill of swimming across the current at the top of the falls, scrambling over the rocks and jumping into the Devil’s Pool. It’s difficult to imagine a better view of the falls or a more exhilarating scene. You really have to see it to believe it. 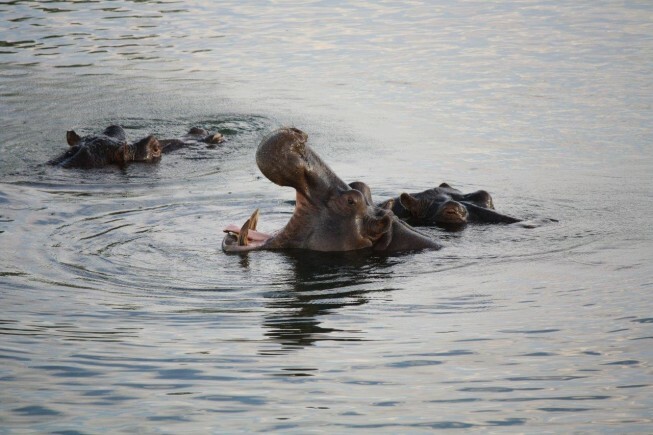 Tongabezi Lodge offers five tours per day during the dry season (September – December) and our 1 ½ -hour tour included a boat ride to the island, guide and breakfast (lunch and afternoon tea are also available). We posted up at the Zambezi Waterfront, which was pretty basic and packed with rowdy travelers of all ages from around the globe, but it was a good location outside of town a bit and right on the river. The lodge features riverside rooms as well as camping options and a restaurant with full bar. Other than a rather unfortunate incident with a monkey at breakfast (although I hear it’s good luck), the Waterfront did the trick for me. The adjacent David Livingstone Safari Lodge offers a more high-end experience and backpackers rave about the Jollyboys backpacker lodge and camp. Livingstone is worth the visit. 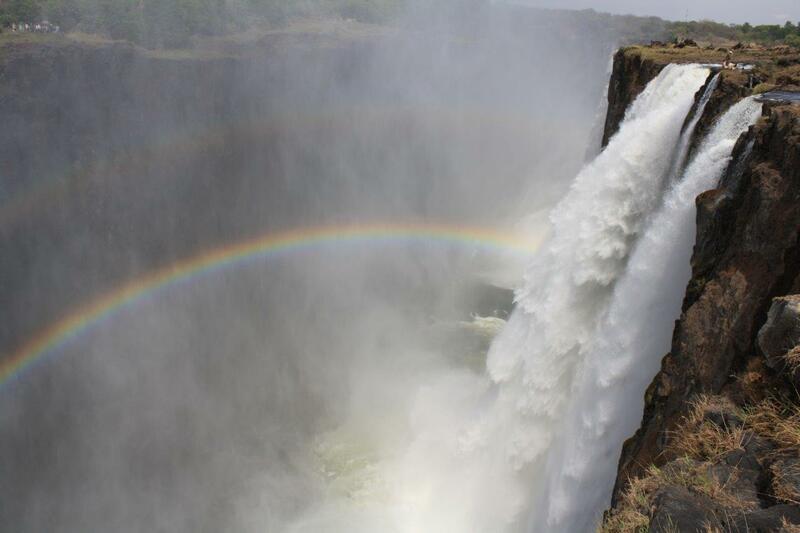 Victoria Falls will blow your mind and the Zambezi isn’t as scary as it sounds. That being said, get there before the dam goes in. Preliminary work on a dam 56 kilometers downstream from the falls has already begun and, though there’s no way to know for sure, the consensus is the river would be flooded all the way up to Rapid #7.